Nestled in the heart of downtown Holland, just miles from stunning Lake Michigan, is the historic campus of Hope College. Created with a focus on academic excellence and rooted in the Christian faith, Hope has a prominent and unified history with the city. Although officially chartered in 1866, Hope College began its journey in October 1851 with the creation of the Holland colony’s Pioneer School. With support from the Reformed Church in America, Rev. A.C. Van Raalte started the school with the desire to create an educational experience for Holland children that was rooted in Christian character — an option not guaranteed through state-funded schooling. As educational needs progressed, the school evolved into the Holland Academy and later into the college. However, before the Pioneer School could open, it needed a building. Van Raalte had built an orphanage on 12th street, where Western Theological Seminary now stands, in 1850. (After settling in West Michigan, the hard winters had taken a toll on the colony and left many children parentless.) By the time the Pioneer School opened, the orphanage was no longer in use, as the surviving colonists had taken in the orphaned children. Van Raalte repurposed the orphanage, and the building acted in many educational capacities until it was destroyed by a fire in 1889. In 1857, Van Vleck Hall was built. It still stands at the center of the college campus. As Hope’s oldest building, Van Vleck Hall was essentially the entire campus at the time of construction. It housed students, the college’s first president, the library and classrooms. The solid construction of Van Vleck Hall is one of the reasons the building, along with Pillar Church, survived the Great Fire of 1871, which wiped out much of the community. In the fall semester of 1862, Hope College enrolled its first freshman class of 10 men. The college received its charter from the State of Michigan in May of 1866 and graduated its first eight seniors two months later. Women were admitted to the college in 1878. While the college suffered through some lean years, it eventually experienced an enrollment boom after World War II. With servicemen returning on the GI Bill, enrollment spiked from about 550 students to 1,374 by 1947. 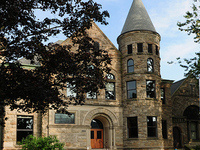 At this point, Hope College began to build upon the campus and academics to create the influential college it is today.